If you and several friends are considering group travel to Italy, do it. It is a great way to travel, while saving money with package discounts and making memories that will last a lifetime with your friends and family. Did you know that traveling groups are often offered travel discounts if traveling in Italy together on a group reservation? Additionally, if you have enough people in your group, you can travel for free or take advantage of major deals and discounts just for being the organizer. It is not easy to create a group itinerary that takes into account the balance of the group versus the individual. If you work with an expert to build or review your plans, you can ensure that you can experience some terrific group events, but also give everyone time to go off exploring on their own and take advantage of local attractions that might not be of interest to everyone. Choosing the travel expert who is able to help you create an Italy group travel itinerary is an important decision to make. You'll want someone who already understands the unique needs of a group, but also has real world experience with group travel to Italy in order to help make the most of your time abroad. This trip offers a lesser known side of Italy where the focus is on fashion, food and countryside over history and architecture. Investigate cutting edge fashion in Milan, relax and marvel at the ethereal beauty of northern Italy's lake region, try your hand at cooking Northern Italian regional dishes, stroll through the renowned coastline and villages of Cinque Terre and finally concentrate on Parma's excellent prosciutto and ham via a guided factory tour and food tasting. 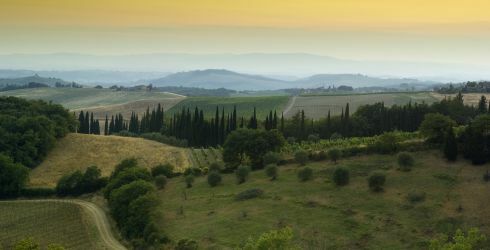 View the complete day to day Northern Italy Itinerary. Explore quintessential Italy on this Italian adventure to Rome, Venice, Assisi, Florence and Siena. The trip begins with the formality of Vatican City and the landmarks of ancient Rome. It then continues on to the magical city of Venice and the art mecca that is Florence with stops in enchanting Assisi and Siena. Get a taste of Italy's best architecture, art and history. View the complete day to day Rome, Venice & Tuscan Villa Itinerary. If you always knew there was much more to Italy than Rome, then this is the tour for you! From magical coastlines, to Roman and Greek ruins and local crafts and wine, venture off the beaten path to delights many visitors never see. Learn about ancient cultures, get out on the water and have time to shop for unique handicrafts while visiting southern Italy's best destinations. View the complete day to day Naples, Sorrento, and Sicily Itinerary. This 7-night itinerary kicks off with an unforgettable rail journey through the heart of the Swiss Alps on the legendary Bernina Express. After enjoying incredible views of glaciers, dramatic mountain passes, verdant valleys, pristine lakes, and magnificently-constructed bridges, your group will arrive to the Italian-speaking part of Switzerland for a healthy dose of Mediterranean temperatures, interesting sightseeing, and relaxation on Lake Lugano. From there you will continue into Italy and spend three nights on the shores of Lake Como before finishing up in Milan, the fashion capital of Italy. View the complete day to day Scenic Railways in The Swiss Alps and Italy's Lake District Itinerary.